TeachPitch is raising £300,000 investment on Crowdcube. Capital At Risk. TeachPitch solves the problem of information abundance for teachers and schools. The company’s software is used in hundreds of schools, is partnering with a major Education company in China and has started to certify its users to provide online tutoring to other educators on the platform. Platform has 10,000s of active users from over 130 countries. B2B: CMS software will be rolled out to over 500 schools worldwide. B2C: Sells certificates allowing teachers to tutor other teachers. TeachPitch was acknowledged as 1 of the 20 fastest growing eLearning companies in the United Kingdom in 2015 by EdTech Europe, as 1 of the 50 best tech companies in the United Kingdom by the Great British Entrepreneur Awards in 2016 and received an Award for Educational Excellence, Teaching and Leadership by the World Education Forum in Mumbai in 2017. TeachPitch is back to raise investment on Crowdcube to accelerate its expansion in China, grow its tutoring program and develop a mature machine learning and AI technology. B2B: helps schools organise, manage & discover the best of online learning. TeachPitch has signed commercial deals with notable educational institutions in the UK, USA and China. Also partnered with Education company OneWorld for software to be used in over 500 schools. TeachPitch has received an offer for a $150,000 grant by international non-profit organisation for rollout of technology in public schools in Eastern Europe. B2C: Recently launched Certified Online Tutor Program. It’s a new revenue stream selling annual certificates to users so they can offer their tutoring services to other teachers. Since launch in December 2017 nearly 300 teachers have registered for the program. The company’s Chinese partner OneWorld will provide TeachPitch Certified Online Tutors into China via a customised app created with the aim to tutor over 1 million students. 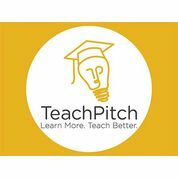 To see the rest of the TeachPitch pitch, join now. Join to read more information about the TeachPitch team, documents, and what other investors are saying about the pitch.